. : How does it work?
. : Why would I give this to clients or employees?
. : What do callers ask?
. : What about the card?
. : Can I see examples of cards used by various industries?
. : Why would people with smartphones need this service?
. : Who can use this unique promotional product?
. : Can I read some testimonials from customers that have used this?
. : Are there any case studies I can take a look at?
. : Can I see some examples and get a complimentary sample?
. : View Powerpoint Presentation NOTE: Presentation may take a moment to load. WOW! is the first & only live promotional product. WOW! is a cell phone based branded personal assistance service. When you gift your clients, prospects, members and employees with your custom VIP cards, you give them instant access to YOUR personal assistance service. Recipients of your VIP cards can call in 24 hours a day, 365 days a year and ask absolutely anything they can possibly imagine ... any task, any question, at anytime from anywhere. All in your company's name! 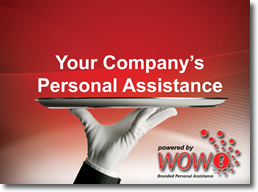 You gift your clients, prospects, members & employees your custom VIP Personal Assistance Cards. Recipients call a toll-free number 24/7/365 from anywhere in the US or Canada. Callers are greeted BY NAME in your company name. "Hello Mrs. Wilson, Thank you for calling [YOUR COMPANY NAME] Personal Assistance. This is Amanda. How may I assist you?" Callers are impressed with the personal attention they received and your service, leaving a lasting memory of the experience. Your branded VIP card is kept in recipient's wallet and now becomes a mini billboard advertising your company! Why would I give this to clients and/or employees? Today's challenging economic times require companies to spend their marketing dollars more effectively. People like to feel special. WOW! helps you treat them like VIPs! You can satisfy the needs of every client, prospect, member and/or employee by GIVING THEM WHAT THEY WANT! "People helping people" transcends all demographics -- everyone needs help with something! Gifting is easy with your customized card. Your card will be created with your logo & design. The card is a full color, laminated credit card sized plastic card. The WOW! Creative Team will design everything for you ... or you can design it yourself. Cards can be completely customized, too -- any material, size and shape. Can I see examples of cards used by various industries? Yes! You can view cards from some of the most popular companies that have used the WOW! Program. Click here to view those cards, which you can sort by industry. Why would people with smartphones need this service? We perform actual tasks -- not just give information. We have access to subscription-only databases. Texting/researching while driving is becoming illegal in most states. Our team of professional assistants can perform research faster than a person on a smart phone can ever do. Who can use this unique promotional product? Universal applicability is what sets WOW! apart from any other promotional product on the market. Can I read some testimonials from customers that have used this? Sure! Click here to read testimonials from many satisfied WOW! customers. Are there any case studies I can take a look at? We've got a couple of great case studies for you to read and get your own ideas percolating. Click here to take a look. Can I see some examples and get a complimentary sample?